46 mm carbon case, sapphire-glass back, screw-in crown, carbon dial with yellow accents, pellaton automatic winding calibre 80110 movement with integrated shock-absorption system, date display with crown-activated rapid advance, central hacking seconds, approximately 44 hours of power reserve, black rubber strap with textile inlay and yellow threads. Water resistant to 12 bar. 46 mm carbon case, sapphire-glass back, screw-in crown, carbon dial with red accents, pellaton automatic winding calibre 80110 movement with integrated shock-absorption system, date display with crown-activated rapid advance, central hacking seconds, approximately 44 hours of power reserve, black rubber strap with textile inlay and red threads. Water resistant to 12 bar. 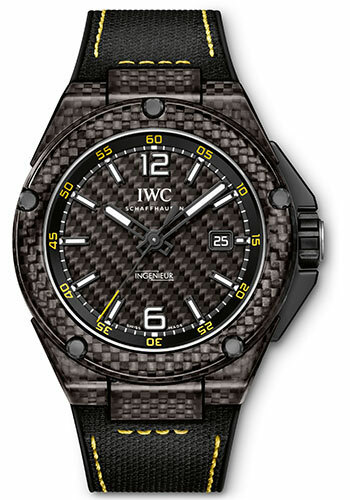 46 mm carbon-fibre case, 14.5 mm thick, ring of titanium back with engraving one out of 1000, screw-in crown, ceramic bezel, convex sapphire crystal with flat, antireflective coating on both sides, black dial, calibre 80110 automatic movement with date display and central hacking seconds, approximately 44 hours of power reserve, black rubber strap with embossed calfskin inlay, pin buckle. Water resistant to 12 bar.